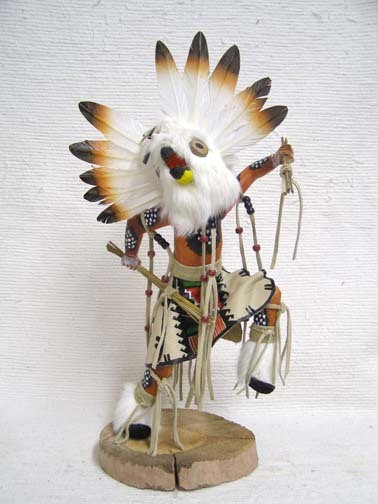 Genuine Native American treasures: Kachina Dolls (Katsina), Zuni Fetish, Pottery, Dream Catchers, Jewelry and other artifacts. 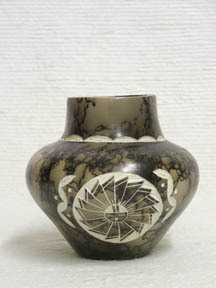 The ancient Indian tribes made this pottery to honor a favorite horse or to celebrate the birth of a horse. 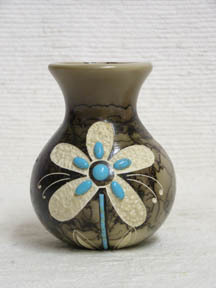 This pottery is very time-consuming and hazardous to create. The pottery is poured, fired for a period of time after which it is removed from the kiln, hair from the mane and the tail of a horse are placed on the pottery. The hair creates the dark lines and the smoke from the burning hair creates the darker grey areas. The pottery is then returned to the kiln where it finishes firing. 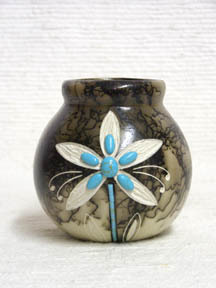 When the firing is complete, the pottery is removed from the kiln, spray-glazed and etched. Each piece of pottery comes with a certificate of authenticity. This certifies that the pottery has been handcrafted by a Native American Indian artist and identified by a tribal census number. 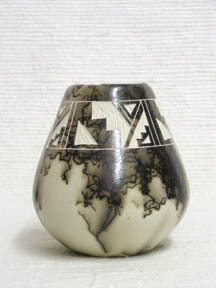 These wonderful small horsehair pots are all traditional shapes and are decorated with turquoise. Great as a group or individually. Etching will vary. 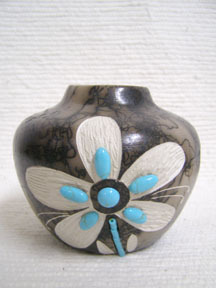 Native American Made Ceramic Horsehair Small Pots with Turquoise These wonderful small horsehair pots are all traditional shapes and are decorated with turquoise. Great as a group or individually. Etching will vary. The hole on the side was to make it easier to carry and handle when the vessel got wet from the cold water. Etching will vary. This wild bucking horse is a classic symbol of the American West and a wonderful reminder of the importance of the horse to the Native American People. This horse figure exemplifies the wild spirit that remains in these beautiful animals. Etching will vary. The eagle represents the messenger between the people and the Great Spirits. 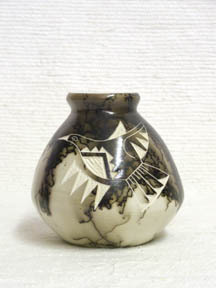 This small figure will be a constant reminder of this powerful bird and what it symbolizes. Etching will vary. 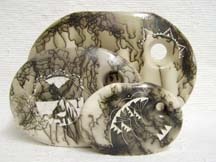 Renegade Horse $45.00 7x 7.5" Flying Eagle $45.00 10"
The outer circle of the Medicine Wheel represents the universe and your circle of life. The cross represents the Four Sacred Directions. The circle and the cross draw from the universe and bring into your circle of life good medicine and protection from misfortune and harm. This open shield has crossed arrows (a sign of friendship), dreamcatcher, medicine pouch, medicine wheel, and pipe. This item is handcrafted and therefore beading and feathers will vary. Certificate of Authenticity included. Sioux legends speak to us of the dreamcatcher. It is believed that each carefully woven web will catch your dreams in the night air. The bad spirit dreams will become entangled in the web and disappear in the new day. The good spirit dreams will always find their way through the center opening, and will gently float down the sacred feather to bless the dreamer with peaceful dreams. This dream catcher captures the beauty of this sacred legend. 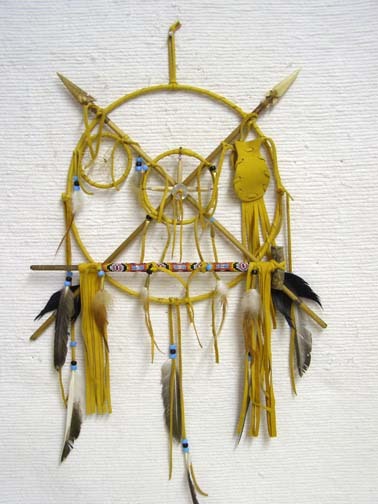 According to the Sioux, legends speak to us of the dream catcher. It is believed that each carefully woven web will catch your dreams in the night air. The bad spirit dreams will become entangled in the web and disappear in the new day. There are many legends about Turquoise; The Pima consider it to bring good fortune and strength and that it helped overcome illness. 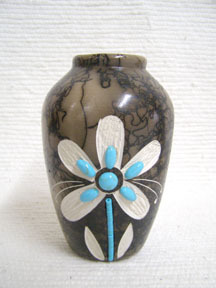 The Zuni believe that blue turquoise was male and of the sky and green turquoise was female and of the earth. Pueblo Indians thought that its color was stolen from the sky. In Hopi legend the lizard who travels between the above and the below, excretes turquoise and that the stone can hold back floods. The Apache felt that turquoise on a gun or bow made it shoot straight. The Navajo consider it as good fortune to wear and believe it could appease the Wind Spirit. Copyright © 2005 by New Thought Kabbalah All rights reserved. Revised: 22 Feb 2015 22:03:08 -0500 .